Inverted Hns Brekout in APL LTD ABOVE 670 should test alltime highe on close above 670.
triple bottom formed at around 512-514 during Feb to June 2016. The intermediate peak was 662 and a significant breakout above that level confirms a breakout. Even a cursory look at alembic charts indicate that 660-665 has been a major resistance for Alembic. That seems taken out today with stock closing above 675 with volumes. It needs to be seen if stock can sustain above 660-670 levels for next few trading sessions and then make an attempt at a strong upmove. 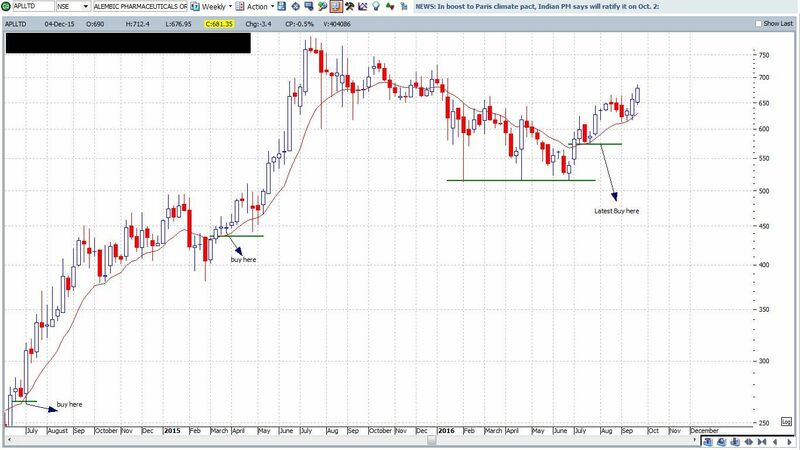 If the triple bottom formation is valid, target could be in the vicinity of 800 plus. But that might take some time or a heavy dose of positive news. 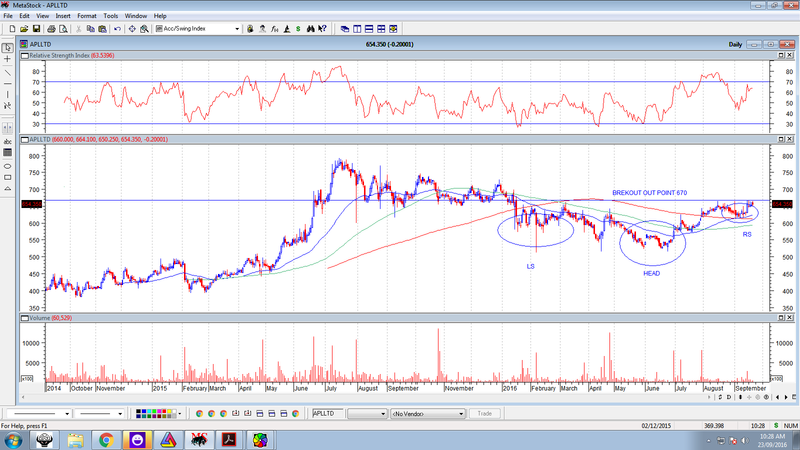 Attached alembic chart with triple bottom formation and a potential breakout from the pattern. Sir, even after learning basic charting. How do u practise and become better.? Can any body please highlight the negatives for this company? I’m trying to write up pros and cons for this company going ahead. I’m only seeing major positive points for Alembic and standard Pharma industry risks. This makes me believe either I’m very biased or actually there are no big negatives going ahead. @sta, In learning technicals you have to keep practicing and observing to keep getting better. Spotting simple patterns like double/triple bottom, inv head and sholders, cup and handle, breakouts from multi year highs/all time highs are all a matter of practice. Having said all that technically it seems it has done a lot of consolidation trying to digest real and perceived negatives and forcing some sceptic and dukhi aatmas out of the stock. Lets see how it goes. For me it presents a very interesting technical picture to observe and see the outcome. Thank you Hiteshji for sharing the negatives. I was going through reports of Torrent Pharma, Aurobindo, etc. It seem most of them are increasing their R&D expenditure. It is good if we look from a long term perspective. A single molecule like Abilify will bring in more revenue than Alembic will spend on the research. Even a infrequent blockbuster molecule could do wonders to the earnings as Abilify did. I think a good way to track their research is to see the number of ANDAs for USA market they will file from the next year onwards. One positive which I have noted is that USA and other markets are getting more skeptical of Chinese generic suppliers. So, USFDA cannot replace or do without Indian generics. India is now perceived as a quality generic supplier. Also, these frequent FDA checks will make Indian generics company to put more focus on Quality. Alembic seems to have done good always with FDA inspection and remarks. There might be some exception like Wockhardt who even after so much time are not able to get approval. I just can’t think of a reason for so much delay for approval for Wockhardt considering it being a big Pharma company. Their expansion plans are interesting to watch out for. I read somewhere that it takes time for a new Oncology player to setup things well and Oncology does seems to have infinite number of sub genres which are beyond my understanding. We can just hope it can do well. If all these generics player expand outs well in Oncology then it could be a difficult situation for Shilpa Medicare where the triggers are yet to play out. But for now it seems Shilpa will have a massive advantage as they started out early in Oncology. Yes, pricing control in domestic drugs could play as minor risk as you said but then again I feel we don’t need to worry much as Alembic is more focused on exports. It seem Alembic is more into speciality drugs so they seems to be less affected from it. Another thing to note is that somehow these pharma companies are finding a way to bypass government regulations. I remember when they introduced pricing control previously, some of the companies changed the quantity size to create a loophole. Not sure if this was patched. On a personal level, I’ll vote for pricing control in the domestic market as a lot of loot is going on here in India. But then again lets not worry about this risk yet. I do not understand technical charts but I just wish it works as you see it. Will be good for all investors here and increase their confidence in this company. On a personal level, I think it would be unfair to give Alembic less than 3 years from now if we are invested in it. Disc. Invested. Please do your own due diligence. 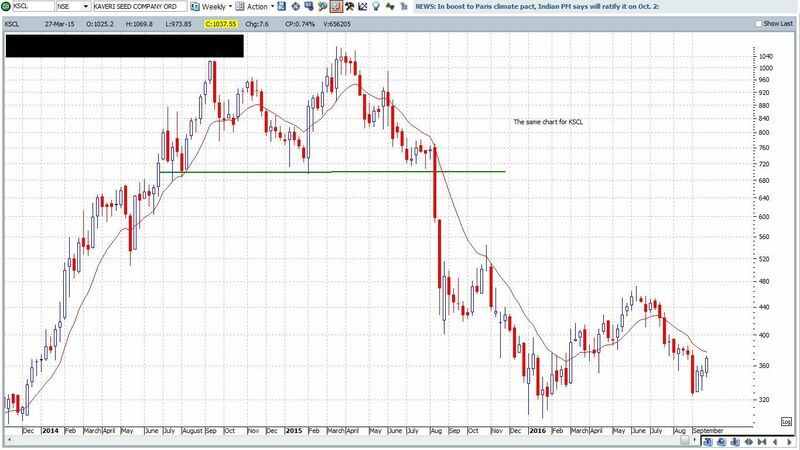 Please find attached 2 wkly charts. I follow these charts for all my investments. APLLTD and KSCL. When I added for Alembic at every dip I got out in case of KSCL.
" What is your edge in Investing or Trading"
over the last 5-7yrs the low hanging fruit in the form of generics exports to the usa has been largely completed.indian generic cos have now entered a phase where they have to sell newer and more complex molecules , hence the increase in RD .time will tell who will be able to win round 2.till then expecting fireworks from this sector as a whole would be wishful thinking. Eli Lily is the innovator for the drug and tadalafil is PDE5 inhibitor marketed in pill form for treating erectile dysfunction. It is a competitor for Viagra and the largest selling erectile dysfunction drug in the world. The patent for the drug is expected to expire in November, 2017. Currently, apart from Alembic, Aurobindo and Synthon Pharma hold the tentative approval for the drug. The overall market size of the drug is USD 1.26 billion for the US markets. There are lot of DMF filers for the drug and more players might get tentative approval for the drug. Interesting thing about the drug is that Eli Lily has entered into an agreement with Sanofi to make the drug over the counter. Though I have read all details provided about pharma approval procedures. Does this tentative approval mean that alembic will be able to sell the gcialis? As per my understanding, Alembic is one of the First to File along with Aurobindo and SYNthon and these 3 companies along with original company can sell these products in the USA from today onwards till 6 months. Please correct me if there is anything wrong in my understanding. Alphin, that is a different thing. That is called drug exclusivity. What is the benefit of this tentative approval then? You can use Google to learn the basic glossary. We must keep this thread specific to Alembic discussions by not cluttering it with basic questions about Pharma. Mods, may deleted non-useful posts. @Alphin tentative approval means the company has submitted all the documents for filings and got the nod of FDA for this molecule, but the originator has gone to court asking for not giving the approval to other companies as he(Originator) has patent for the same. Forum members please correct me if I am wrong forming the statement. I think the queries should be asked immaterial to the thread. This will help enhance the knowledge of the readers. Even I have doubts and queries in pharma which I am still searching but could not get answers from Internet. Unless you are from that industry it gets hard to search for the terms and their relevance. As an investor you should be curious to find the answers and fill all the gaps. Alembic Pharma receives EIR from USFDA for the formulations facility located at Panelav. This is closing of an inspection that had take place earlier in the year (March, 2016). The Panelav facility is very important for Alembic in the larger scheme of things. The monkey is off the back for now particularly considering Warning letter trend as illustrated in the following chart. First of all don’t call me sir. There are various stages in which a drug gets final approval from USFDA. Tentative approval is given to the players whose ANDA filing is cleared by USFDA. It means that its dossier is proper, bioequivalence study results are complete and efficacy is as per the original (innovator) drug. A dossier/file even after tentative approval goes through various checks like whether the plant from which the formulation will be manufactured has no significant pending 483 observations or import alerts (we were told by Alembic management that even after tentative approval there are at least four to five departments in USFDA through which a dossier goes before final approval). We saw that both Zydus and Sun had tentative approvals for gAbilify (aripiparazole) but failed to get final approval due to 483 observations at their plants. Furthermore, the final approval is given only after the patent expires. Most of times, tentative approval is given before expiry of patent of a blockbuster drug. So does this mean that Alembic has found the way to manufacture the generic version of the drug with the same base molecule as the original, hence it cant challenge for the exclusivity for sale. But after the patent expiry it will be a free to sell gcialis along with any other competitors who are able to manufacture the molecules. And this free market will be open after patent expiry that is on Nov 2017. The summary of my understanding is that, the profits from this tentative approval, subject to it getting the final approval, can be only realised in Nov 2017, and by that time any other pharma companies with the similar drug may also get final approvals.